It was the first day of the World Cup and Brooklyn's eateries and bars were getting ready to be taken by storm for the following month. I made my way a few block closer to the river in Williamsburg to do a visit with Ridley Howard and Holly Coulis. To my luck, Coulis had recently moved into Howard's studio — this was gonna be a doubleheader made up of two of my favorite players. I arrived to find the door to their storefront studio invitingly open. There was a drawing table set up for me to work, the radio was playing a satisfying mix, and fans were going in multiple directions. After we put in a few dedicated hours of working, talking over art and having Ridley explain to me some of the ins and outs of the Cup, we made our way to a Mexican Joint for half price drinks, tacos, and of course, Game One. This was going to be a visit that took place over an entire weekend. I was already hoping that each day would end with beer and guacamole. I'll start by talking about Howard's paintings and my experience drawing them. There was a lot to take in as he is getting ready for his 3rd solo show at Koenig & Clinton opening late October. A phenomenon occurs in Ridley's work that makes it difficult to understand that they are simply made with paint and mediums on canvas. It might be that I have gotten used to certain tricks within the realms of art making, but there where no extra tools or light boxes used here, just straightforward painting built on finesse and patience. Howard painstakingly layers transparent or semi-transparent paint to create changes in chroma, value or hue. Light penetrates through these multiple glaze applications to deepen the color and develop subtle complexity of skin tones. This optical mixing makes Howard's canvases, which are composed of clean cut shapes and slickly rendered figures, teeter between the virtuosity of a Van Eyke and the pop imagery of a David Hockney. Howard gives a nod to geometric abstraction and traditional oil painting at once. And the figures in his work, with their slight expressions and somewhat stoic posturing, sublimely coexist with the sleekness of the paintings' surface. In one piece, as a male and female character kiss, they seem to be aloofly melting into their positions, equally embraced by a field of color and each other. Coulis' work takes a captivating and fresh look at traditional painting by way of still-life and figuration. She reminds me how much I relish the endless possibilities that come from utilizing the most familiar and principal painting subjects. 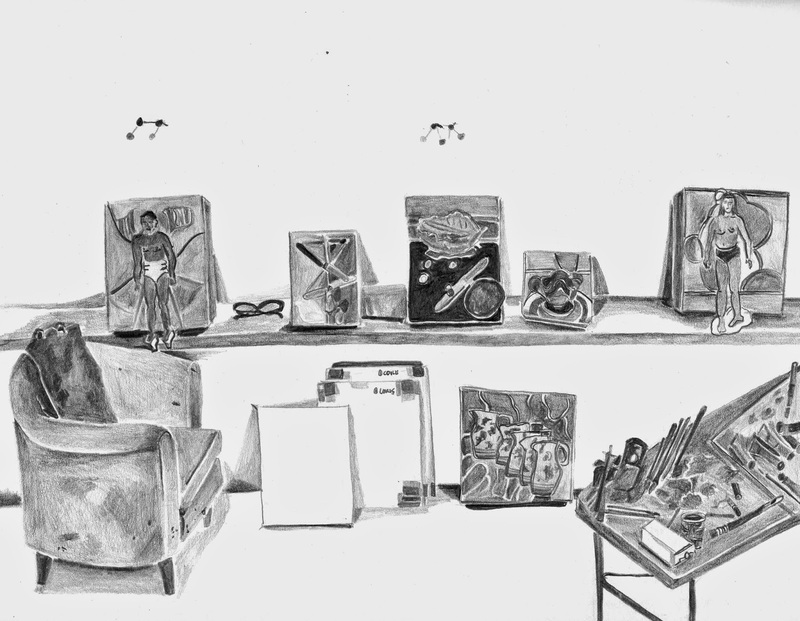 After drawing her studio I made an enriching visit to the Barnes Foundation in Philadelphia and could almost imagine her paintings nestled between a grouping of Matisse and Cezanne still-lifes. I think it is in the way Coulis is able to activate the spacial elements of her canvases by flattening the picture plane, while exaggerating the subjects' light and shadows through her intelligent use of subtly varied color and width of line, that I make these connections. Her current paintings, with their focus on drawing, where so exciting to me when I saw them this past February at her solo show at Sardine Gallery titled Pitchers. We spoke extensively about the strong linear qualities that have taken hold over the past few years. 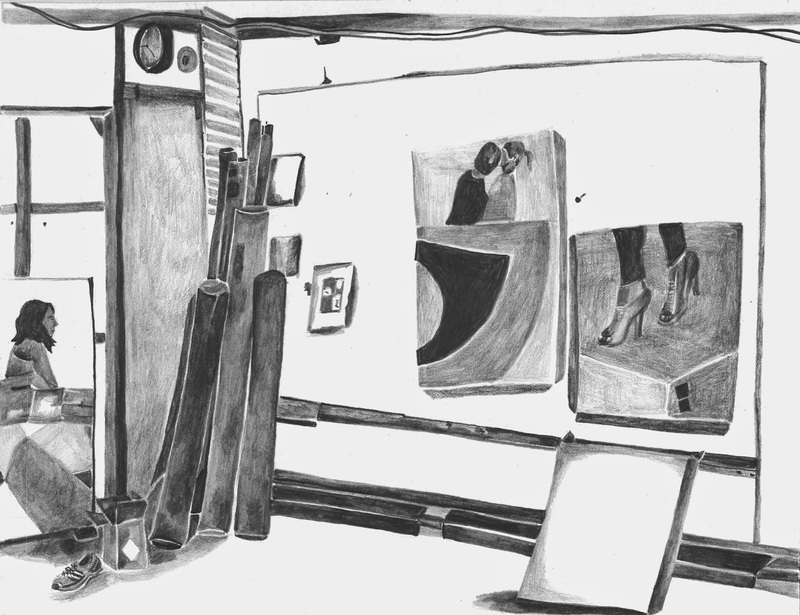 Coulis carries her initial outline of the shadows and objects as well as perspective lines throughout her process. If her first marks are drawn in red, this vibratory relic of the painting's beginning still holds a strong position at the painting's end. Sometimes a satisfying rainbow of colors can be seen around a line if multiple layers have been added to a given form and traces of those layers have been left behind. It isn't at just a glance that all of this is uncovered, but with an investigative eye, making her paintings all the more enticing to spend time with. No pitcher left unturned. It was pretty fun to have all three of us working at the same time and we agreed that it reminded us of being in art school: making art in a big space and throwing jokes back and forth, only at no teacher's expense. I couldn't help but observe how this married couple helped one another throughout the day. As both were painting they would quietly ask each other's advice and gently speak words of encouragement. And, yes, there was beer and guac at the end of each visit. This week is the last week to see Coulis' work in a group show at Sargent's Daughters and she is also in a group show called "Tossed" at Jeff Bailey Hudson that opens August 16. To see more of her paintings please go here http://hollycoulis.com/. Howard's show opens in October at Koenig and Clinton and he has a piece currently in a group show at Fredericks & Freiser titled "Unrealism Part I". To see more of his work please go here http://www.ridleyhoward.com/.